Even the Daily Mail has resisted the temptation to lay into the hated BBC over the news that Jeremy Clarkson will not be getting his Top Gear contract renewed. Normally, the obedient hackery of the legendarily foul mouthed Paul Dacre would not let any such opportunity pass, but the Mail is also the party of law and order, and with the Police now taking an interest, they will at least wait before kicking. That's what I think of youse bladdy disciplinary procedures, ya bladdy Pommie broadcasting drongoes! No such restraint has been allowed to enter at the Baby Shard, where Creepy Uncle Rupe’s faithful retainers have, as one, gone for the Corporation big time. Included in the assault has been the supposedly independent Times, but then, since James Harding was sent down the road, there has been precious little independence on view. This morning’s editorial, titled “Petrolhead Down”, is as crude as it is predictable. At first, all is reason and agreement: “Tony Hall, the director-general of the BBC, is right. 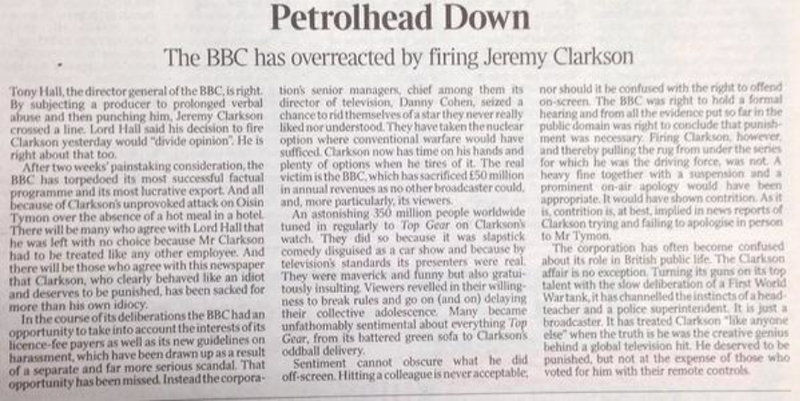 By subjecting a producer to prolonged verbal abuse and then punching him, Jeremy Clarkson crossed a line”. And then comes the dissent: “Lord Hall [this means he’s a toff] said his decision to fire Clarkson yesterday would ‘divide opinion’. He was right about that too”. Yes, the Times is going to say the Beeb was wrong. We are not surprised. “The BBC has torpedoed its most successful factual programme”. What, they cancelled the main evening news? But do go on: “and its most lucrative export” [this assumes Jezza is irreplaceable]. “And all because of Clarkson’s unprovoked attack on Oisin Tymon over the absence of a hot meal in an hotel”. You see? A racially aggravated assault is no big deal, because this is TOP GEAR and it’s ONLY A BIT OF A LAUGH. “In the course of its deliberations the BBC had the opportunity to take into account the interests of license fee payers” pontificates the leader. What happened to the idea of treating employees equally? Jezza either crossed a line, or he didn’t. Oh, and there’s the obligatory “Danny Cohen [and others] seized a chance to ride themselves of a star they never really liked nor understood”. Cohen was not involved in the decision. But the Times lets it slip as it muses “Many became unfathomably sentimental about everything Top Gear, from its battered green sofa to Clarkson’s oddball delivery … A heavy fine together with suspension and a prominent on-air apology would have been sufficient”. Yes, that kind of behaviour can be then spun as acceptable, and don’t anyone mention that Jezza was on his last warning. And a Murdoch pundit. And Rebekah’s pal. Why should the Murdoch press be so concerned about the license fee payers? Well, they aren’t. The reason Rupe’s troops are opening up on the Corporation is that they still have a lot of money and credibility invested in Clarkson. That investment is now at serious risk, serious enough for the Times editorial to match the opinions and financial interests of its proprietor. Rupe wants the Beeb to make his pundits worth reading. The Beeb has no such responsibility. 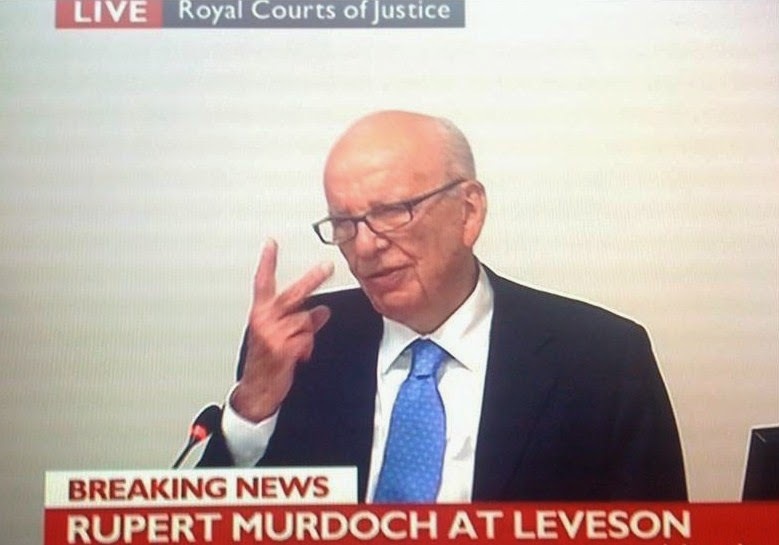 Murdoch can take his suggestion and shove it.